The nearest underground station is Hillhead. The car park is located on South Front. Designated parking bays are not clearly marked. 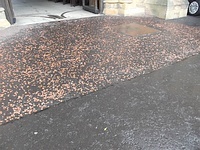 The nearest Blue Badge bay is 35m (38yd 10in) from the South Front Chaplaincy entrance. 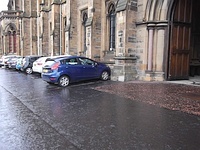 The furthest Blue Badge bay is 60m (65yd 1ft) from the South Front Chaplaincy entrance. 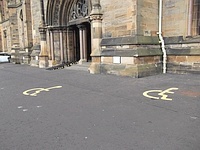 Standard bays next to the South Front Chaplaincy entrance to the left can be made available by booking in advance. Drop offs can be made directly in front of the South Front Chaplaincy entrance. 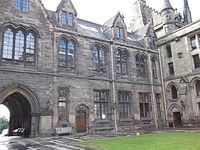 You are on Outside Access (West Quadrangle - South Face Entrance). Skip to the next section. This information is for the entrance located to the left of the South Front. The width of the door opening is 260cm (8ft 6in). 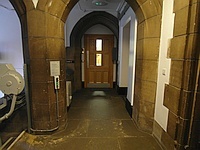 The second photograph shows inside the West Quadrangle from this entrance towards the Chaplaincy and Fore Hall. You are on Level Change (West Quadrangle - South Face Entrance). Skip to the next section. 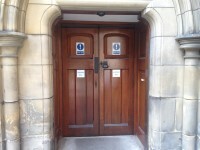 You are on Outside Access (West Quadrangle - Left Chaplaincy Entrance). Skip to the next section. 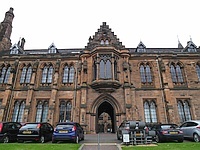 This information is for the entrance located to the left from the West Quadrangle - South Face Entrance. 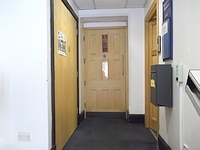 The width of the door opening is 106cm (3ft 6in). You are on Level Change (West Quadrangle - Left Chaplaincy Entrance). Skip to the next section. The step(s) is/are located leading up between the doors. You are on Lift (West Quadrangle - Left Chaplaincy Entrance). Skip to the next section. 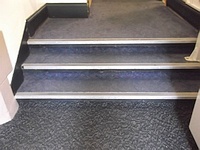 The floors which are accessible by this lift are WQ, 2. 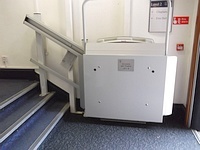 The lift is approximately 1m (3ft 3in) from the West Quadrangle Chaplaincy entrance. 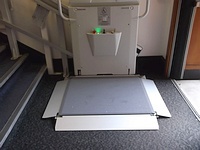 This lift requires assistance from staff with the key by prior arrangement. 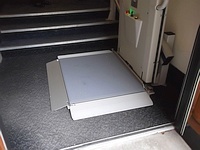 There is a similar lift to the other side of the chaplaincy with a door width of 65cm which is 73cm wide and 85cm deep and offers a flip down seat 48cm high. 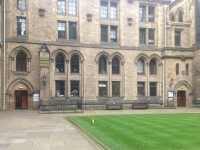 You are on Outside Access (West Quadrangle - Right Chaplaincy Entrance). Skip to the next section. You are on Level Change (West Quadrangle - Right Chaplaincy Entrance). Skip to the next section. The step(s) is/are located between the two doors. You are on Lift (West Quadrangle - Right Chaplaincy Entrance). Skip to the next section. 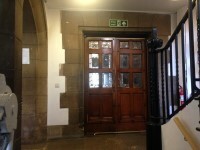 The lift is located just inside the West Quadrangle - Right Chaplaincy Entrance. 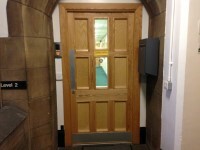 The lift is approximately 2m (2yd 7in) from the West Quadrangle - Right Chaplaincy Entrance. 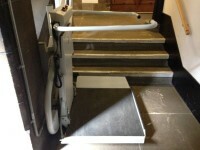 The dimensions of the lift are 75cm x 84cm (2ft 6in x 2ft 9in). 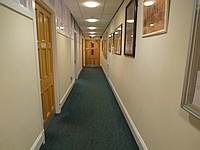 Photograph 1 shows the chaplaincy office corridor. 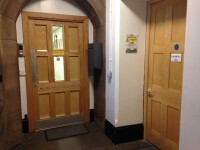 Photograph 2 shows the forehall and offices doors. 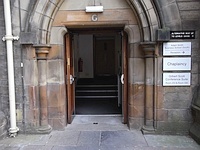 Photograph 3 shows the corridor link to the chapel. 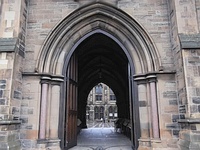 Photograph 4 shows the internal doors to the chapel. You are on Chapel Forehall. Skip to the next section. 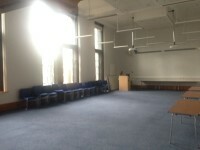 The chapel forehall (Room 256) is located behind the chaplaincy offices, to the south side of the chapel. 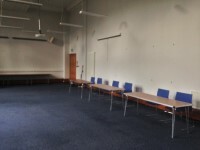 It is a multi-function room that is used for ceremony preparation, meetings and other functional use. 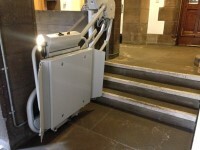 Access is via the West Quadrangle entrances, with lift access. 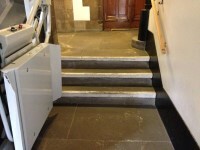 There is level access between the Forehall and the chaplaincy offices and the Memorial Chapel. 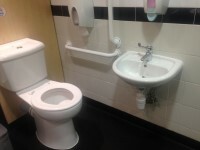 You are on Accessible Toilet (Chaplaincy Offices). Skip to the next section. 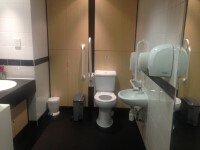 This accessible toilet is approximately 1m (3ft 3in) from the West Quadrangle - Left Chaplaincy Entrance. 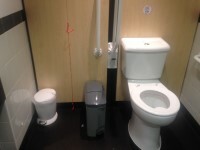 The dimensions of the accessible toilet are 162cm x 334cm (5ft 4in x 10ft 11in). 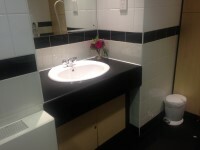 The height of the hand dryer is 113cm (3ft 8in). 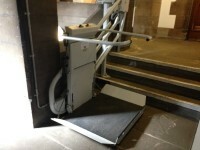 There are standard (and accessible) toilets throughout the Gilbert Scott Building near the Hunterian Museum lift on this level, or on the level below in One A The Square cafe/brasserie. There are baby changing facilities in the accessible toilet at the Hunterian Museum lift. Disability awareness training is available for all staff through the Staff Development Service. 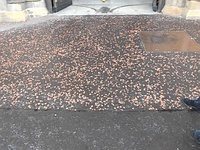 Other training relating to specific areas of disability awareness, such as curriculum development or a specialised software package is provided from the Learning and Teaching Centre, IT Services and the Student Disability Service.